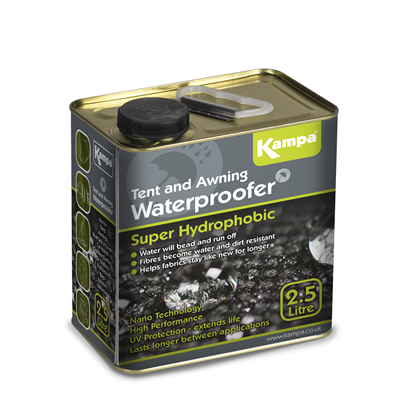 Kampa Super Hydrophobic Waterproofer offers innovaitive top class protection bassed on revolutionary Nano Technology. When the nano protector penetrates the fibres become water and dirt resistant - water will run off. Suitable for restoring the durable water repellent finish (DWR) on breathable fabrics, maintaining their beathable qualities. A built in UV filter helps fabrics stay like new for longer. Works on synthetic fabrics, natural fabrics, leather, suede, wood, stone. Ideal for:Tents,Awnings,Outdoor Clothing, shoes,boots,ski clothing,rucksake,bags,furniture,umbrellas . Offers protection to all absorbent surfaces. Coverage: up to 6-18 m² per litre depending upon the fabric type, polycotton material will absorb more liquid therefore has a lower m² per litre coverage.